The Berenstain Bears School Time Blessings by Mike Berenstain is a wonderfully cute book for kids! It’s back-to-school time in Bear Country but the cubs are nervous about the new challenges to come. Mama and Papa Bear remind their cubs that prayer and God’s love are always there to guide them and that they will always support them no matter the challenge. While my kids are homeschooled they enjoy learning what it would be like to go to school through the bear cubs. This is a terrific book to help ease anxiety about going back to school. 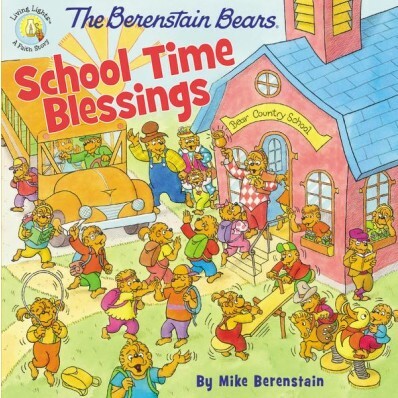 The Berenstain Bears School Time Blessings is filled with beautiful illustrations and is such a fun book to read. My kids enjoy reading this before bed and love that we have a new Berenstain Bears book to add to our collection! by Mike Berenstain on Amazon, Zondervan and Barnes and Noble and other bookstores.